So few decent photos I’ve captured so far (in fact, this maybe my only one). 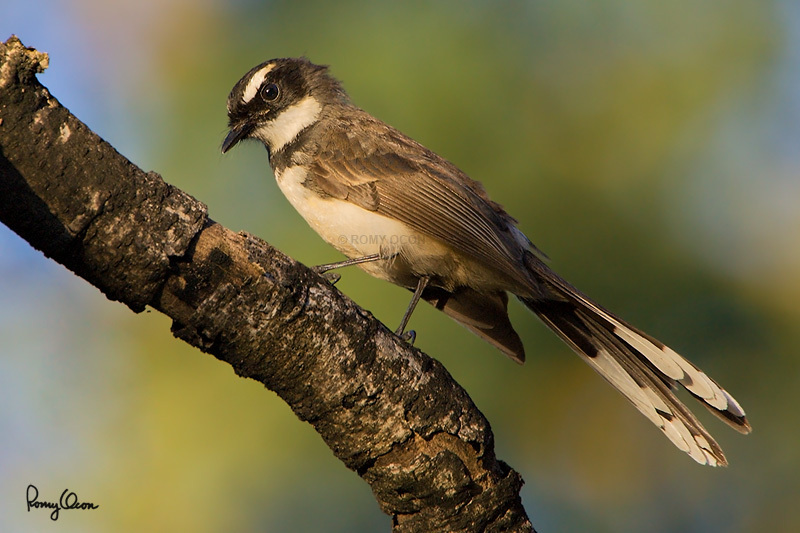 This fantail, with a 7.5-inch total length, ranges in all major Philippine islands. It is conspicuous and noisy in many places, including urban residential areas and parks. It is easily seen and in many instances can be approached closely. However, its continuous tail fanning and constant movement among branches make it probably among the toughest common birds to photographed well. This individual was captured inside the campus of the University of the Philippines at Diliman, Quezon City. I hand held my 1D MII + 100-400 IS + 1.4x TC so I could follow the active bird better. I might have only one useable photo of this species, but I’m glad it was under golden, late afternoon light. Even with a 1.4x TC and shot wide open, the optics of my 100-400 IS perform quite well. Habitat: Common in parks, residential areas, thickets, early second growth and mangroves. Shooting Info – UP Diliman, Quezon City, Philippines, November 20, 2006, Canon 1D MII + EF 100-400 IS + Sigma 1.4x TC, 560 mm, f/8 (wide open), ISO 400, 1/320 sec, hand held. Footage of this species continuously fanning its long tail.